Marketing is one of the most effective ways to showcase your property so long as you’re aiming your message at the right audience. In fact marketing can be used to sell pretty much any service or product. Perhaps you’re a first-time investor and are feeling unsure about how to attract new tenants? Alternatively, you may be an experienced investor looking for new available avenues to discover to maximise your profits? 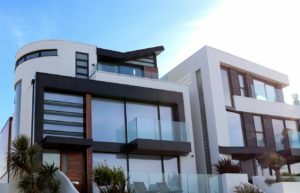 Either way, there is an abundance of factors you need to take into consideration to make sure your property stands out from the crowd and attracts the right tenant. The type of property you are selling will come into play – whether it is residential or a student investment – as this will dictate how you market your rental effectively. Before you put pen to paper, you need to define who your target tenant is. This way you can adjust your content accordingly to make sure you have the right tone and message to appeal to your target audience. If you cannot pinpoint a specific target market, then it may be worth asking yourself who do you expect to live there? Are there any universities nearby? What are the travel facilities like for young professionals and recent graduates? When you deploy your marketing ideas, you should consider who is moving in and out of the local area as well as thinking about what your target audience might appreciate about the neighbourhood itself. If you own a property in the hustle and bustle of the city, you would expect working professionals and graduates seeking employment to been keen on a property located in an area like this. On the other hand, this kind of location would not be suitable for a young family as city centres are often too busy are sometimes deemed unsafe for small children. 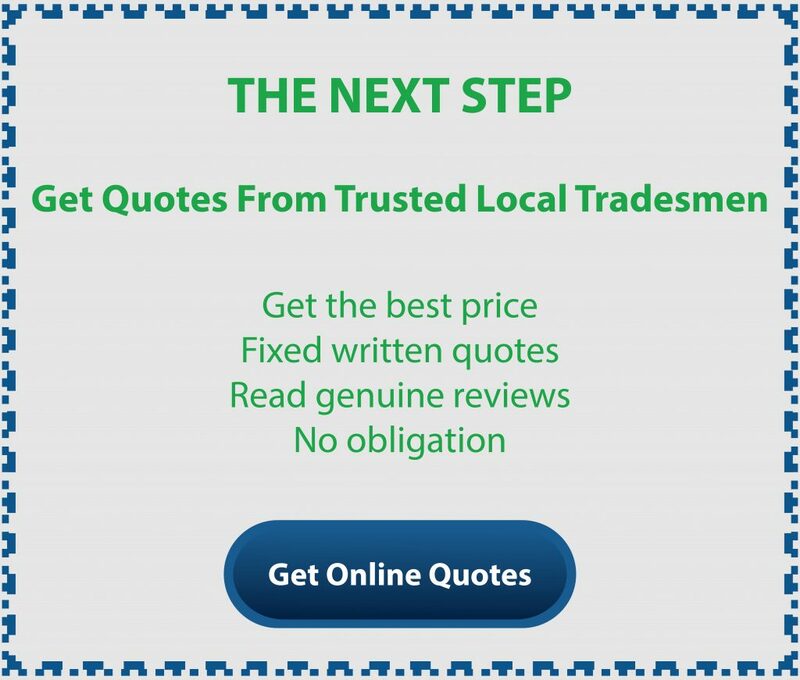 Regardless of who is writing your property advert, you must ensure that you use the right language is being used. People aren’t interested in over-complicated linguistics, so get straight to the point and lay out what your property offers and why it is right for them. The key to producing successful content is to keep it concise and straightforward, informing people about your property quickly and succinctly. One of the best ways to gauge whether your content is engaging and enticing is to compare it to established property professionals like RW Invest. As property specialists, they use their website, info packs and email newsletters to promote their latest developments with convincing language detailing the main selling points. If you feel that are you not confident enough in creating a creative and descriptive advert, then why not consult the help of a freelance writer? They can assist you with creating compelling content, which includes the most attractive selling points in the most attractive way possible. A photograph is one of the first things that captures attention and draws prospective tenants to your advertisement. Therefore, you need to make sure that the images you use are powerful, eye-catching and positive. Try to avoid photographs taken in poor light or ones that appear blurry and unclear. Images that are bright and sharp will ultimately make people more likely to view your property in person. Before you sell or rent your property, you should make sure that your property is looking the best it can. Repaint any chipped paintwork, touch up worn out decor, tidy up your front garden and consider doing a thorough deep clean. Adding a few finishing touches to your property will go a long way and ultimately create a great first impression which should help to boost your kerb appeal significantly. After creating your listing, it would be beneficial if you spread the word as much as possible over multiple channels. Word of mouth is a great way to get people talking about your property and will hopefully boost the number of enquiries. There are several ways to do this – including sending a quick text message to your friends, family and work colleagues. It’s amazing how quickly news travels and often you’ll find friends of friends may be interested in a rental property. Using your personal social media accounts is also a great way to maximise exposure. Not only is this a great avenue to explore, but it is also a free way of listing your properties online. Posting a link to your property listing can help to showcase your property as well as giving you the opportunity to add another sales pitch on your social media post. Posted in UncategorizedLeave a Comment on How can you effectively advertise your rental property to attract new tenants? It’s really important to stay fit and active as you get older, not least because it can stop you becoming overweight as well as reducing the risk of getting a number of different health conditions and chronic diseases. However, keeping fit when you are entering your later years is not always easy as your body naturally slows down and finds it harder to undertake physical exercise. Luckily keeping active when you are older does need to mean running half marathons or going to a boot camp for the weekend. Instead, there are many different exercises and activities you can do which will help you maintain your physical fitness levels. These range from gentle exercise routines in the home to more strenuous activities such as running, swimming or cycling. Which type of exercise you choose is really down to you own personal capabilities and what you feel most comfortable doing. The really important factor is to remain as active as possible, regardless of what type of exercise you prefer. Keep your heart healthy – Coronary heart disease or CHD is a major killer in the UK, with 14% of men and 10% of women dying each year from the disease. However, those who take regular exercise are at a lower risk of developing CHD, as well as being less likely to develop heart disease high and high blood pressure (the latter of which is a commonly linked to having a Stroke). Reduced risk of Cancer – According to data from Cancer research UK, around 25% of all deaths in the UK are from a form of Cancer. Physical exercise, although not a preventative measure can help reduce the risk, particularly when it comes to bowel, beast and womb related cancer. Maintain well being and mental health – Exercise can also have psychological as well as physical benefits, such as maintaining a healthy state of mind and well being. It can also improve your overall mood as well as helping to relieve depression, something many older adults suffer from. Reduce risk of dementia – Although not medically proven, many experts believe regular exercise can help reduce the risk of dementia. It is also argued that regular exercise can help those already with dementia as it can improve sleeping patterns as well as making individuals stronger and more flexible. Improve social interaction – Exercising can also be a way for older adults to become more sociable, particularly if they partake in a group based exercise activity, such as a fitness class for example. Isolationism is a major problem for many older adults, particularly if a partner dies before them. Exercise can be a great way to stay active and engaged with others in the community as well as building up new friendships. Maintain independence – Perhaps one of the most important benefits of regular exercise is it allows older adults to maintain their independence, something many older adults cherish above all else. Even gentle exercises can help avoid being reliant on others to help with mobility. Reduce risk of type 2 Diabetes – Individuals who are overweight or obese are more likely to develop type 2 diabetes, something around 4 million people in the UK already have. Taking regular exercise as well as maintaining a healthy diet is an obvious way to prevent you becoming overweight and in turn will help to reduce your overall risk of getting type 2 diabetes. Keeping bones strong- Exercise can also help prevent brittle bone disease (osteoporosis), a condition which many older people suffer from. In fact research has shown that osteoporosis in the primary reason why 50% of men and 20% of women aged over 50 will break a bone. Find something you enjoy – You are more likely to stick at something if you are enjoying it, so pick an exercise or activity you will actually like doing, rather than doing something purely for the sake of it. For example if you like music and dancing, join a Zumba class or, If you like being in a team, why not join a running club? Find a fitness buddy – Having an exercise partner or friend alongside you should help you stay motivated. It can also make the exercise or activity more of a social event rather than just a chore. Set goals – Setting goals can be useful if you want to upscale the level of exercise you are undertaking. It’s not for everyone, but can be useful for those who want to measure and improve on your current fitness levels. Get into the fitness habit – Nothing beats repetition like having a routine, so make sure you plan your exercise activity ahead. For example, getting your stuff ready the night before may help you with willing yourself into sticking with your routine. Have a treat – Exercise and keeping fit does not mean you have to go cold turkey on life’s luxuries, so make sure you “treat” yourself now and again to some chocolate or a glass of wine, whichever is your preference! Walking – one of the easiest ways to stay fit and healthy is to take regular, brisk walks. For those who really want to get into this, there is the option of finding a local walking club. Walking football – For those who prefer a team activity an increasingly popular pastime in walking football. Age UK, the UK leading charity for older adults run a number of walking football clubs up and down the country. Pilates / Yoga – If you prefer something less strenuous then Pilates or Yoga maybe just for you. Most routines are done sitting or lying down and can help boost muscle strength. 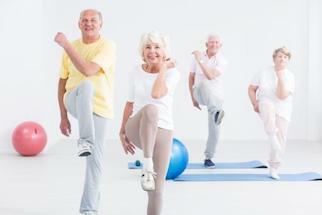 The website YogaClassNearYou allows you to find over 50’s Yoga classes in your local area. Zumba Gold – A lower intensity version of the popular activity Zumba, this routine is popular with older adults across the UK. Visit the official Zumba.com website to find a class near you. Golf – Notwithstanding classic stereotypes about older people going down the golf club, golf is a great way to stay fit in later life. Dispelling another stereotype, it is also not just the preserve of older men as most clubs now admit both men and women. Tennis– This is a great sport for those who like to be competitive in a one on one environment. Can often be weather dependent of course, but a great way to stay fit and active all the same. Swimming – Another fantastic way to stay fit with most local swimming centres running dedicated sessions for older adults. 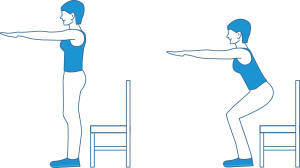 Squat to chair – Stand in front of a chair and keep your feet wide apart. Move your hips back and start to bend your knees without actually sitting down. Outstretch your arms forwards to help maintain your balance. Repeat a dozens times if you can. Wall Push – Great for those who cannot get down to do press ups. Standing two feet or so away, place your hands flat against a wall, keeping them inline with your shoulders.Bend your elbows outwards and lift your heels as if you were doing a press up against the wall. Repeat up to 12 times. Wall Angels – Stand with your back facing the wall and your arms positioned at a right handle. Start to move your hands up and down whilst trying to keep your back against the wall. Repeat a dozen times. Quadriceps Stretch – Really simple, just stand at ease and then bend your knee backwards until you are holding onto one foot.You may find holding onto a chair or sideboard with your other hand will help you maintain your balance. Hold for 30 seconds and then release, repeat as you feel comfortable, then swap to the other foot. These are perfect for older adults with limited mobility. 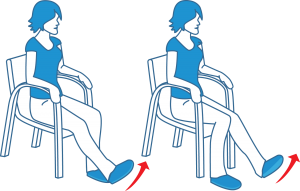 Ankle circles – Sit upright in a sturdy chair and then outstretch one leg, keeping the other foot on the foot. Start to rotate your ankle in a circular movement. Do 10 to 15 rotations on one leg and then swap to the other leg. Heel Digs – Sit upright, place one foot flat on the floor. 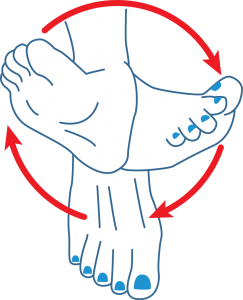 With the other foot, pull your toe towards you shin.Repeat 10 or 20 times, then swap to the other foot. 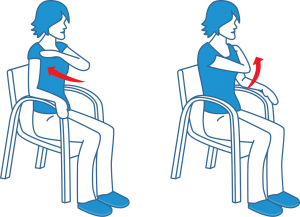 Arm Across body – Place your right arm diagonally across your left shoulder, then return your right arm to the sidearm of the chair.Repeat 10 to 15 times, then swap arms. 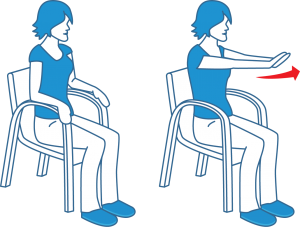 Arm back and forth – Again sitting up right, outstretch both hand forwards in front of you, then, move your hands back to the arm rest. Repeat 10 to 20 times. 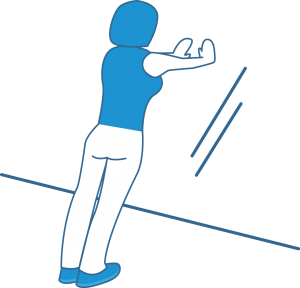 Arm move with heel dig – This combines two of the previous routines. Place one hand on your opposite shoulder with your arm diagonally across your chest. At the same time dig one heel into the floor and move your toe towards our shin, keeping the other foot flat. Return your hand to the armrest. 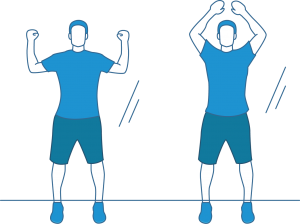 Repeat 10 to 20 times then swap arm/foot. 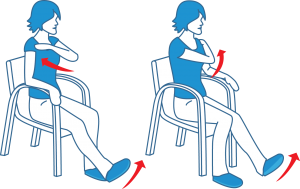 Neck rotation – Sit up right, looking forwards. Gently turn your head left 90 degrees, holding that position for 5 seconds, before slowly moving back to facing forwards. Repeat the same action to the right. Walking the dog – This will benefit you as well as the dog. Why not try a longer or different route, or chase the ball or stick in the park. The extra step will really help. Childcare – Many over 50’s will confess this can be the most exhausting exercise of them all! 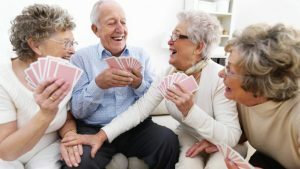 Great for the body and mind, playing games with the grandchildren is a lovely way to stay fit and active. Gardening – Enjoy the fresh air as well as a weed-free garden. Just be careful not to over do it when stretching down. Take the stairs – Whilst it maybe tempting to get in a lift or escalator, merely by opting for the stairs you can help to improve your overall fitness levels. Getting back into work is something some seniors find difficult to achieve. Employers often have some outdated ideas about what older applicants may be capable of. They may worry that older workers will be overqualified, stuck in their ways or that their skills may be outdated. Unfortunately, ageism definitely exists in the world of work opportunities. What benefits do older workers bring? In addition, mature employees tend to have excellent communication skills, plenty of tact and diplomacy coupled with the ability to remain calm. They also bring a wealth of experience to companies and can be an excellent role model for younger workers. Finally, they are less likely to change jobs as often as younger workers, meaning that the time and money spent on training seniors will make good financial sense. These attributes mean considering older workers is a vital part of modern businesses and can contribute to the success and profits of a company. Whether you are looking to return to your previous area of expertise or seeking new challenges and opportunities, follow these 10 tips to get a head start in the employment race. Create a relevant resume – While it is tempting to cram all your experience into your resume it is better to be clear and specific by tailoring each version of the resume to each individual job application. Don’t feel like you have to list every job you had since school or college. Instead focus on the last 10 or 20 years of relevant experience which will be enough to demonstrate your skills and abilities. Remember you do not have to put your date of birth on your resume. Use age to your advantage – Emphasize the benefits of your maturity. You have lots of experience and a wealth of knowledge as well as key attributes such as a good work ethic, dependability, wisdom, and organisational and communications kills. Make sure you emphasize these qualities and show evidence for them. Show that you are tech savvy – Many employers worry that older workers will not be familiar with the latest technology. While this is obviously a ridiculous stereotype, it makes sense to show it is not the case for you. Emphasize your proficiency with commonly used programmes such as Microsoft Office and Excel, as well as any more specific to your profession. Provide evidence of using technology and if necessary, brush up on your skills. Join Linkedin – Having an up to date LinkedIn profile can also help you showcase your skills and experience while also demonstrating you are au fait with technology. LinkedIn has more than 15 million jobs posted and 350,000 employers looking to hire, so it’s a great platform for finding a job. Use it to brand yourself and build a network.If you aim to work in an area where social media is important then having a great social media account can be very helpful. However, you need to commit to this. Having lots of bare profiles on a variety of platforms can look worse than having none. So, choose one or two and keep them interesting and up to date. Finally on this section, be careful to avoid references to old, outdated systems or technology. Keep up to date with professional developments –With a constantly changing workplace, it is essential to show that you are up to date with developments in your area. Subscribe to relevant publications or websites, go to conferences or take a training course to ensure you are up to speed. Counteract the ‘overqualified’ stereotype – If you are applying for a job that is not as high flying as some you have had in the past, make it clear to the employer why this is. Explain that you are looking for a change of direction or a new challenge. Unfortunately, stating that a candidate is overqualified is one of the ways ageism can surface, so head this conversation off. This is also where tailoring your resume to each individual job can help as you can match your experience closely to the job title. Another reason employers are wary of over qualified candidates is that they perceive them as stuck in their ways and resistant to change, so ensure you demonstrate being open to learning new things, perhaps by giving an example of a new role you have taken on in the past. Tell them why you are worth the money – Employers may be concerned that more mature candidates will cost more to employ. If the question of pay rates comes up at an interview, be prepared to explain why you are happy to take a pay cut, or conversely, making it clear how your experience and skills will benefit the company and therefore warrant a higher rate. Consider part time, temporary or voluntary employment – Older candidates have an advantage over younger workers in that they can sometimes consider part time work, contract work or even voluntary work. This can provide relevant experience to add to your resume as well as potentially leading to full time work with the company. Embrace the opportunities that temporary work offers to brush up on relevant skills in your field. Voluntary work also provides an opportunity to give back to society and can be a fulfilling experience. Exploring the voluntary opportunities available in your area of expertise can also boost your confidence and wellbeing, which can often take a bashing from the recruitment process. If you are looking for a career change, voluntary work gives you a chance to explore the options to find out if the profession is right for you as well as boosting your relevant skills. Learn new skills – If you are out of touch with the developments in your profession or are looking to make a career change, then brushing up on your skills is key. As well as learning new skills by volunteering, you can also take advantage of the huge range of training opportunities and courses available. There are courses on every possible topic available locally or online. For example, you can take professional development courses, or a diploma or degree online. Taking courses shows a willingness to learn and embrace the changing world of work, meaning employers are less likely to see you as stuck in your ways. You can find training and learning opportunities at your local library, job centers or local education college and many of these are free or subsidised. Put yourself out there – Put yourself out there and build up a network of contacts to be in with a chance of interviewing for these jobs. If you have existing contacts in the industry, make sure you use them. In addition, take every opportunity to build your network by attending professional conferences as well as career fairs. If you don’t currently have any contacts in the field you are looking to enter, you can still get the word out about your knowledge and skills. Find relevant groups on Linkedin and join group conversations that are taking place. Ask people for help and learn who the industry influencers are. Once you find a companies that interest you, email them your resume with a well written covering letter explaining that are looking for a employment opportunities in their industry. Speculative applications are always of interest to employers as it saves them paying recruiter fees. Practice – Attending interviews can be a daunting prospect if you haven’t done them for a while. The key is to practice as much as possible. If you can, find a younger person who has some experience of interviewing and ask them to interview you and offer feedback. Recruitment consultants are often a good place to start. Show how you can help the company – If you can turn your interview into a sample of what it would be like to work with you, then you will be a more memorable candidate. Use every opportunity to show how you can help the employer achieve their goals. Leave your ego at the door – It can be tricky being interviewed by someone younger and with less experience than you. However, an interview is the perfect opportunity to show that you are comfortable working collaboratively with those around you no matter their age or experience. Avoid sounding like you always know best and try to come across as open and ready to learn. Keep examples short and to the point – Avoid telling long stories about your past experiences. Keep examples short and succinct. Identify the challenge you faced, state the action you took and explain the results. Eliminate anything that does not help make your point. Practice these examples and try to make sure you answer any question in around 2-3 minutes. General Advice – Whatever you have done in the past will have taught you skills that can be transferred to other roles. As well as paying attention to skills you have learned from previous jobs, look at other areas of life such as parenting, caring for an older relative or being active in societies and see what skills you have that would be relevant in the field you are considering. Remember, it’s not just your previous employment which can teach you things as your life experience will have given you a wealth of knowledge and skills which can be of great benefit to potential employers. If you are getting older and find coping with the bills a struggle, the government may step into give you a helping hand with a range of benefits. A lot of older people don’t claim money they are entitled to because they are too proud to ask or do not know the money is there for the asking. Charity Age UK says around £3.5 billion earmarked as benefits to boost the income of over 65s goes unclaimed every year. If you have problems paying the bills, here’s a run down of government money you could claim to make life a little easier. Don’t forget, you qualify for some by age, while others depend on your income and savings. Getting around when you are older can be tricky if you have a disability, illness or poor eyesight. Some councils and local charities run free rides to hospitals, clinics and day centres, but if you live in a rural community, simply getting to the shops can be a major logistical exercise. Most local authorities and transport operations offer discounts to older passengers, but the qualifying age can vary. Others only run their concessions at certain times of the year. Buses – Contact your local council for details of any concessions in your area. Trains – A senior railcard for the over 60s costs £30 and offers a 30% discount off local and national train fares. A three-year railcard costs £70. Coaches – Companies don’t offer a national scheme, but some operators give senior discounts. National Express has a coach card giving a third off fares for £10. London Freedom Pass – Only available for Londoners, a London Freedom Pass gives free travel on all rail, bus, Tube and river transport services in the capital for anyone who has reached the state pension age for women (66 years old from October 2018). A range of government and local council benefits can help the elderly struggling to pay day-to-day living costs. Most are means and age tested, which mean qualification depends on how old you are and how income and money in the bank you might have. Guarantee Credit is extra money for pensioners whose state pension is less than a certain level. Savings Credit is another top-up who have saved in a pension but still have a low amount of money to live on. What you get is listed in the table below – but don’t forget Savings Credit is only paid to those reaching state pension age before April 6, 2016, when the new flat-rate state pension started. Council Tax discounts vary from council to council. Some offer none, while others offer savings depending on age, income and a home’s council tax banding. Sometimes, Council Tax cuts go together with receiving other benefits, such as the Guarantee Credit top-up with Pension Credit, so it’s always worth checking with your local council to see what’s available. If you pay rent, have a low income or claim benefits and do not have more than £16,000 in savings, you could claim housing benefit. Pensioners receiving Pension Credit Guarantee Credit are likely to have their entire rent paid. Homeowners cannot claim housing benefit but can seek a loan under the Support for Mortgage Interest (|SMI) scheme. The government pays two sums out to help pensioners meet their heating bills during the winter. The Winter Fuel Payment depends on your age and if you live with someone or claim benefits. The payment is automatic, tax-free and does not impact other benefits. The payment is adjusted if you or your partner claim pension credit, income-based job seeker’s allowance (JSA), income related employment support allowance (ESA) or income support. The Cold Weather Payment is on top of the Winter Fuel Payment and is only paid if you receive certain benefits. If you qualify, the payment is £175 for each period between November 1 and March 31 when your local temperature has fallen to zero centigrade or lower for seven days in a row. It’s an unfortunate fact of life for many of us that as we get older, our bodies are not as healthy and reliable as they used to be. The government recognises this with several concessions offered through the National Health Service. Prescriptions – Prescriptions are free for the over 60s across England and Wales – although all prescriptions are free for everyone living in Scotland, Wales or Northern Ireland anyway. Eyesight tests – Everyone over 60 is entitled to a free sight test and may qualify for discounts on some glasses and contact lenses. Attendance Allowance is a payment towards the cost of a carer looking after you. The amount varies, depending on how much help you need. Typical claimants are over 65-years-old who have a terminal illness or a long-term care need – which means for six months or longer. Attendance Allowance is one of the few payments that is not means-tested, and the money does not have to go to a carer, which means you can claim if your partner or a friend or relative is looking after you. Carer’s Allowance pays for someone who looks after you for at least 35 hours a week. The carer can be a partner, relative, friend or a professional carer. Unlike Attendance Allowance, this payment is taxable and may affect other benefit claims you make. A free TV licence is an age-related entitlement that kicks in when you or someone in your household is 75-years-old. The licence is not automatic – you must apply for one. Bereavement benefits changed in April 2017, when the Bereavement Payment was scrapped in favour of the new Bereavement Support Payment and the Widow’s pension became the Bereavement Allowance. If you claim Pension Credit or Housing Benefit you can probably claim the £700 Funeral Payment should your partner die. The money must go towards the cost of the funeral, including flowers, cremations fees and the price of a coffin. The money must be repaid from the deceased’s estate within three months. This is a one-off £2,500 payment – topped up to £3,500 if you have children living with you – plus a payment of £100 a month for 18 months. Bereavement Allowance is paid weekly for a year after your partner dies. The payments depend on age and your partner’s national insurance contribution record. Short term advances – If you are waiting for your first benefit payment for the State Pension, Pension Credit or Carer’s allowance then you maybe able to apply for a short term advance. Repayments will be deducted from your benefit payments once you start receiving them. Local Council – Your local council maybe able to help as there are various assistance schemes you can enquire about. These vary from providing products, services to vouchers and in some cases cash payments. Charities – There are a number of charities who may be able to help you, although you may have to demonstrate that you were unable to get a benefit advance or support from your local council. Use charity search to find a list of relevant charities that may be able to help. Posted in UncategorizedLeave a Comment on What benefits and grants can older adults claim in 2018?